Medicine cabinet at home plays an important role in safety and well- being of our family. 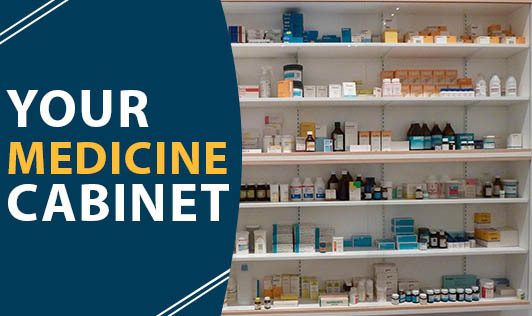 Having well-stocked medicine cabinet at home can save our valuable time, money and worry, we can avoid stressful emergency trips to the chemist shop and hospital if we have an adequate supply of right medicine on hand and proper knowledge of basic medicine. Medicine should be out of the sight and reach of children. Medicine cabinet should be mounted high with lock and latch system in a cool, dark, dry and safe place. Bedroom and hall is an ideal place. Never place medicine cabinet in the bathroom, it is the worst place for that because warm and humid condition inside bathroom can degrade or deteriorate the effectiveness of the medicine. Painkillers- Aspirin, paracetamol and ibuprofen act as painkillers and helpful in minor aches and pains. Antihistamines-These are essential for allergies, insect bites and also in hay fever. Antacids- For painful heartburn and acidity. Anti-diarrheal medicine-To control the symptoms of diarrhea. Oral rehydration salts-To replenish the loss of fluid after vomiting and diarrhea. Decongestants- To give relief from congestion after cough and cold. Sunscreen -Provide protection from harmful rays of the sun. Calamine lotion/anti- itch cream-For itchy skin. Always check the expiry date of medicine before ingesting medicine. Always read the direction and information written over leaflets. Never exceed the stated dose of medicine. Consult the doctor immediately if experiencing any side effect after ingesting medicine.